I hardly ever bake brownies. Not because I don’t like them, quite the opposite. It’s really hard not to eat the entire pan by myself! I could have eaten all of these myself, but to save myself I took them to share with my Sunday afternoon knitting friends. This recipe was the assignment for Tuesdays with Dorie this week. I baked them about 30 minutes, just slightly longer than the recommended time and they are just right. Just the perfect blend of fudgey and cakey. The recipe says to use a ceramic or glass pan, so I used my 9 3/4 inch square corning ware glass pan. 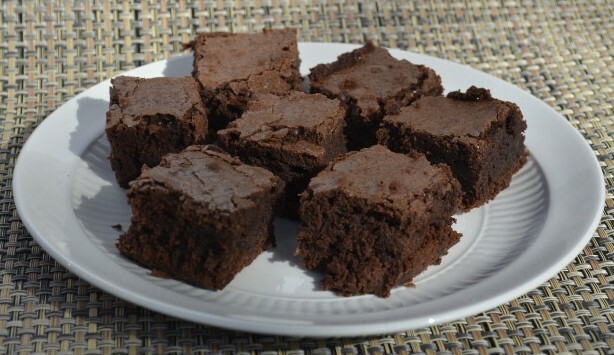 They are excellent, and I must say almost as good as my favorite — Maida Heatter’s, All-American Brownies from her cookie book. If you would like to try this recipe it’s in Baking with Julia on page 331 or check out Monica’s blog, A Beautiful Mess, for the complete recipe. If you want to read about everyone’s experience with this recipe you’ll find all the links to their blogs at Tuesdays with Dorie. I must say, it was great to have a splash of chocolate in this season of pumpkin, apples, and spice. Happy Thanksgiving everyone! i’ve been looking for a brownie recipe for forever!! i’ll have to try this. thank u! These were soooo good. I love a good fudgy brownie. Had to freeze some so i wouldn’t eat ALL of them. Brownies have always been one of my downfalls! Chocolate was a nice change!